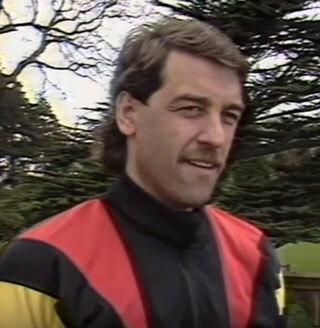 Goalkeeper Gary played just the one game for Watford, the 1987 FA Cup Semi-Final against Tottenham Hotspur, covering for the injured Tony Coton and Steve Sherwood. At the time, Gary had retired from football and was managing a wine bar in Wales. The Roy of the Rovers dream was not to be however as Watford were well beaten, 4-1. Now an estate agent in Newport, Gary spoke to Watford Legends in 2008. It all started for me with a phone call from my father (Eddie Plumley, former Chief Executive) whilst I was at the restaurant I was running, Romans. He phoned me and explained that they had a problem, and that Tony Coton had broken his finger. I thought I was being asked if I knew of anybody who I thought might be able to take over. My father continued to say that Watford had Steve Sherwood, but needed the cover. The club also had a young 18 year old ‘keeper, but one bad game in the FA Cup for him could shatter his confidence. My father then said that the transfer deadline had passed, so they needed somebody who was unattached; and they had asked if I could do it. I was retired, and therefore avaiable. It was the week before the week of the FA Cup semi Final vs Spurs in 1987. I was living in Newport and I met my dad at the roundabout at one of the M4 junctions. I had been planning to go to the game at Villa Park anyway, and my wife and I had even discussed how we might organise the weekend. But I said to her that it doesn’t matter now, as I would be playing! Although it was very tongue-in-cheek, as I knew that my chances were incredibly slim. That said, I started to think about playing more and more. I was training with Newport County on the Monday and Tuesday, and somebody told me that my dad was trying to get hold of me urgently. At which point I punched the air and shouted “Yes!” Because I knew what was coming. I phoned my Dad back and he asked if I was sitting down. He then told me that Graham had called him from Bisham Abbey and told him that Steve Sherwood had dislocated his finger. Graham had asked that I get my backside up there as soon as possible. And that was how it all started. I raced home and put a few things in a bag. I wasn’t nervous, and you can’t begin to imagine how much I was looking forward to going up there – you ask any Watford fan if they would want to play in a semi final and they would jump at it. I wondered why they did not turn to the young 18 year old, and I found out only a couple of years later that it was a young David James that they were protecting. I met up with the team at Bisham Abbey. I knew some of the lads anyway from playing previous away games at Vicarage Road, where I’d always had a good game. But nobody really knew me, other than when I was playing at Watford people knew that I was the Chief Executive’s son. I think Dad was as surprised as I was. I didn’t realise until afterwards that Graham had previously asked Pat Jennings, but Pat had said no. So to be called in to the team after Pat Jennings was quite nice! I first spoke to Steve Sims as he was a mate anyway from our Leicester days, and gradually I said hello to the other boys. Whilst I was there I saw that they were giving some pretty intensive treatment to Steve Sherwood. I trained for a couple of days and everything went really well for me. I was diving all over the place and seemed to be stopping everything. On the Friday afternoon we went up to a hotel in Birmingham ahead of the game, and everybody did all the usual pre match stuff, such as radio, television and newspaper interviews. I had a massive downer on the Satuday morning when we went for a training session. We were going through free kicks and corners. I could see at the far end of the pitch that they were really putting Steve Sherwood through his paces with a fitness test, and I could see that he was throwing himself all over the place. I thought ‘Bugger it!’ I trudged off the pitch and saw Graham in conversation with the physio, and the body language looked like things weren’t going my way. I went up to my room and had a shower. I got a call in my room and it was Graham. He asked if I could go up to see him. He told me that he had been very impressed by the way I had handled myself, and how my attitude had been since I had joined up with the team. He then told me that he had decided to play me. Well, you can’t imagine how I felt at that point. It was a terrific moment. I had to pick myself up again. Obviously I felt sorry for Steve Sherwood, and didn’t realise until afterwards that he had been declared fit. I remember getting to the ground and getting changed. It was a wonderful atmosphere. I was feeling confident – if I did not have the confidence in my ability I would not have played. I recall it was a little surreal in the dressing room as whenever I had played against Watford their dressing room was always so noisy and pumped up, and I was admittedly a little disappointed when that did not happen. It was very calm, and I had been used to caged tigers next door. On the day we didn’t get a result (Watford lost 4-1) and I don’t think anybody played to their full potential, and nor did I. It was one of those occasions when things didn’t click. It might have been a factor that I was an unfamiliar goalkeeper to the other players, but we will never know. Graham obviously thought that he had picked the right team for the day but things didn’t work out. I was disappointed with my own performance, although I thought my place on the pitch had been warranted – I had played in Europe and had played over 250 games professionally; and I had trained well for the game. The first goal for me showed a difference in class to what I had been used to. Clive Allen scored the goal and put a bend on it the likes of which you don’t see in the lower divisions. And I couldn’t hold it. The second one was a deflection off John McClelland. And we went downhill from there. I felt sorry for the supporters, especially behind the goal because it was a mass of yellow, and those supporters had really made me feel at home. I wish I had a picture of those fans as I saw it. The people of Watford were absolutely brilliant towards me. You don’t appreciate how good Watford fans are until you are actually playing for them. It would have been more of a Roy of the Rovers story if we had got to the final, but it wasn’t to be. It certainly was a unique time though!